The victims of an attack at a gay nightclub in Orlando, Florida, the worst mass shooting in U.S. history. Yet Mateen, who pledged allegiance to Islamic State moments before the early Sunday shooting, was able to legally purchase the Sig Sauer MCX (a variation of the popular, military-style AR-15 rifle) and a Glock 17 handgun. The apparent ease with which Mateen secured the weapons used in the massacre has revived a debate over whether those with suspected extremist ties should be able to purchase firearms — increasingly the weapon of choice for those carrying out terrorist attacks in the U.S. Since the September 11, 2001, terror attacks, 85 percent of people killed by terrorists in the U.S. were killed by guns, according to an analysis by the FiveThirtyEight website. That figure, which was based on data from the Global Terrorism Database, did not take into account the shooting in Orlando. The reason terrorists are using guns is that they are "readily available, and they have a better ability to kill with precision," said Malcolm Nance, a former counterterrorism and intelligence officer, who now heads the Terror Asymmetrics Project (TAPSTRI). The increased use of guns in terrorist attacks has led many to speak of a "terror loophole" in U.S. gun laws. 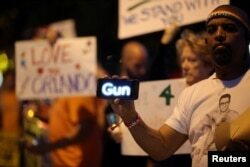 A man holds a scrolling message about guns on his smart phone at a candlelight vigil in West Hollywood, California, following the early morning attacks on a gay night club in Orlando, Florida, June 12, 2016. Senate Democratic Minority Leader Harry Reid said Monday there is "no excuse" for the fact that terror suspects can "walk into a gun store and legally purchase assault weapons and explosives." Democratic Senator Chuck Schumer said he will work to put the issue up for a vote as soon as possible. Donald Trump, the likely Republican presidential nominee, said last November that people on a terror watch list should "absolutely" not be allowed to purchase a firearm. But he also argued that "if people are on a watch list, this is already covered in the legislation we already have." U.S. presidential candidates Hillary Clinton, left, and Donald Trump have both spoken out about gun control laws and the mass shooting early Sunday in Orlando, Florida. FBI officials had put Mateen on a federal terror watch list, as a result of 2013 and 2014 FBI investigations into his "inflammatory statements" and past ties with a U.S. citizen who had gone to fight with Islamic extremists in Syria. He was pulled from the list, however, after no conclusive evidence was found that suggested he was actually linked to terror groups. "I don't think the solution to terrorists killing Americans is to eliminate due process for Americans," Davis told VOA. "I think the solution is for the federal government to do a lot better job of tracking and apprehending these people and building cases against them when they do appear to be terrorists." 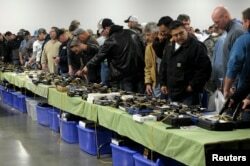 "What's fundamentally important to understand is that we have a gun purchase system in this country that is predicated on speed and making the sale," Everitt told VOA. "Why not have a system that places a priority on caution and then allows due process for the individual involved if they are indeed clean of wrongdoing?" Since the Orlando shooting, President Barack Obama has focused on the "terror loophole" legislation, presenting it as an issue where both Republicans and Democrats can find a compromise. Some Republicans, including Congressman Peter King from New York, have also said more restrictions are necessary, but the prospects of progress for now look grim. "I support it," said King in response to a question from VOA. "But the fact of the matter is, it's not going to pass now."